Cigarette smoking affects kidney health in various ways. Cigarette smoke can enhance the risk of bladder and kidney cancer. Smoking affects kidney health, harm the cardiovascular system, leading to lower blood flow to the kidney and cause kidney failure. There is an indication that heavy metals detected in cigarette smoke such as lead and cadmium which have direct toxicity to the kidney. Nicotine has the power to quicken damage done to the kidneys in other incurable diseases. For instance, smoking can raise high blood pressure and increase the level of kidney problems in patients with diabetes. It is essential to revive that many of these dangerous impacts also happen with passive cigarette smoking or second-hand smoke. It is beneficial for you to avoid cigarette smoke completely to keep healthy kidneys. In this blog, you will get to know, how smoking affects kidney health, can cigarette smoking affect patients with high blood pressure or diabetes, and how second-hand smoking affects kidney health? Does smoking affects kidney health and increase its causes? Cigarette smoking can increase blood pressure and heart rate. High blood pressure cause arteries around the kidneys to weaken and the damaged arteries are not able to pass enough blood to the kidney tissue. 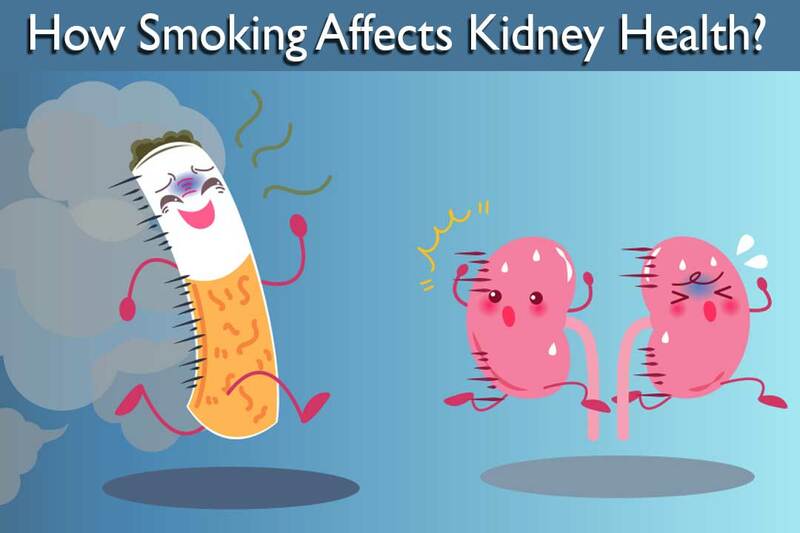 Smoking affects kidney health in a way through which it diminishes blood flow in the kidneys and destroys the sensitive filtering tools that remove waste products from the blood which can cause kidney failure. A Cigarette smoking narrows the blood vessels in the kidneys and often increases high blood pressure and kidney illness. Smoking affects kidney health and forms arteriosclerosis (thickening and hardening) of the renal arteries in which arteries means blood vessels that transport oxygenated blood from the heart to other parts of the body are not able to perform its task which may cause heart attack and kidney problem. Can cigarette smoking affect patients with high blood pressure or diabetes? Cigarette smoking decreases the benefit of the medicines you consume to maintain high blood pressure. Smoking affects kidneys health boosts the chance of strokes and heart attacks in somebody with high blood pressure. Cigarette smoking diminishes blood flow to vital organs and can increase the risk of getting a heart attack, blood vessel, and kidney disease. Smoking diminishes blood flow to your feet, making sores and kidney diseases tough to heal. How second-hand smoking affects kidney health? Cigarette smoking and exposure to secondhand smoking affects kidney health with higher chances of several diseases such as chronic kidney disease and kidney failure. Cigarette smoking and exposure to secondhand smoking can cause you kidney treatment in Ayurveda because ayurvedic medicines have the strength to heal kidney disease or disorder naturally. There are so many natural herbs which provide you with an option to stay far away from cigarette smoking and kidney disease. Smoking and secondhand smoking affects kidney health because of toxic chemicals stay on surfaces even long after the smoke removes and smoke excess long after you clear the ashtrays. Yes, it may difficult for you to quit smoking but, it is essential for your health and the people who stay next to you such as your friends, family, neighbours, and work colleagues. In Ayurveda, the consultant not only works to heal your kidney disease but, also work on its causes. Karma Ayurveda is one of the leading kidney disease treatment centers in India, where almost more than 35000 kidney patients gain relief from kidney disease. Dr. Puneet Dhawan, the co-founder of Karma Ayurveda, dialysis kidney disease treatment and cure high creatinine, and proteinuria with natural herbs. If you and anyone in your siblings are suffering from kidney problems due to cigarette smoking, then contact Dr. Puneet Dhawan in Karma Ayurveda and get a permanent solution for the disease. Ayurveda treatment can stop your dialysis, and by using natural herbs, you can finish smoking affects kidney health.